Applications for the 2019-2020 class are live January 1, 2019 to March 15, 2019. OMRF will offer a premier teen leadership in philanthropy program to Oklahoma students who wish to gain a deeper understanding of the non-profit sector, develop hands-on leadership skills, learn about types of giving, and how they can implement these skills in the community. 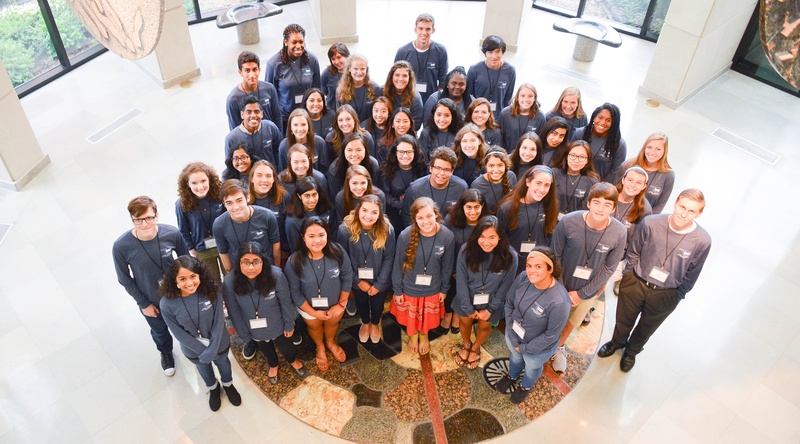 OMRF “Teen Leaders in Philanthropy” will develop a group of teens in the community to be philanthropic leaders and to expand the reach of OMRF to the next generation in the community. Develop and sustain long-term relationships between participants and OMRF. Build participants’ skills to lead, volunteer and give through a hands-on project, with supervision and assistance from OMRF Development staff. Provide a deeper knowledge of the non-profit sector, grantmaking, and philanthropy. Meet leaders from non-profit organizations, board members, charitable foundations, corporate donors, and volunteers. Meet scientific leaders from OMRF to learn about their work. Develop relationships with other teens from different geographic areas and demographics. Completion certificate awarded at program-closing celebration with family in attendance. Eligibility – grade in school: Students who will be in their sophomore, junior or senior year during the program year. Eligibility – GPA: No specific GPA required. However, students must be in good standing. Cost: Free. OMRF Teen Leaders in Philanthropy is funded by OMRF. Transportation: All participants are responsible for their own transportation to OMRF Teen Leaders in Philanthropy sessions and/or events. Applications must be completed online by March 15, 2019 at 5pm. Applications that are received by the deadline are reviewed by the OMRF Teen Leaders in Philanthropy selection committee. Selection committee members evaluate many factors including, but not limited to applications and recommendation letters submitted. Then, finalists will be asked to schedule a brief, in-person interview at OMRF. After interviews, the OMRF Teen Leaders in Philanthropy Selection Committee’s decision is final. Applicants are notified in May whether or not they have been selected for the program. Typically, no more than 3 students from the same school may be admitted to the same class. Recommendation Form: A completed recommendation form MUST be completed and submitted to OMRF.